How Long Should VirusBarrier X9 Take To Scan My Computer? 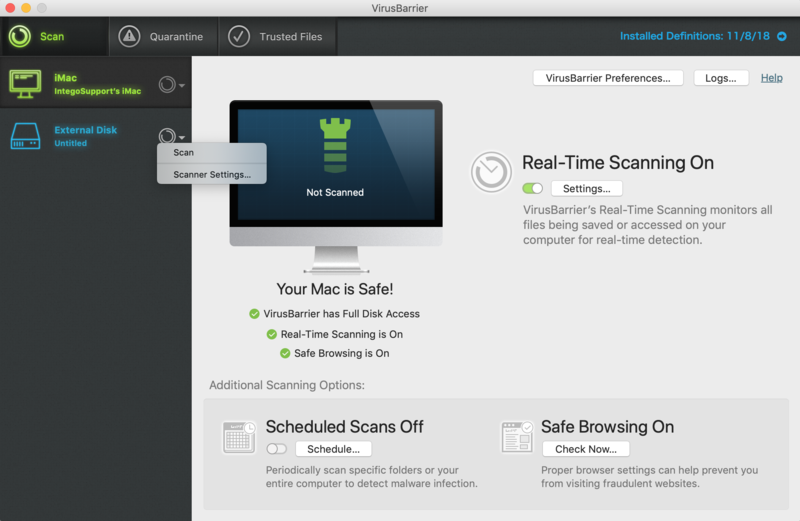 With this option enabled, VirusBarrier X9 uses the least amount of system resources possible when running a scan for malware, which can increase the time it takes the scan to complete. Disable this feature for faster scans. A Full Scan will scan all external drives and volumes, which can increase scan times. If you only want to scan your computer's internal hard drive, open VirusBarrier X9, select the drive in the left column of the window, and click Scan. You can use this same feature to selectively scan external devices, bypassing other drives to make the scan run faster.